So… what do we know about Thwaite? 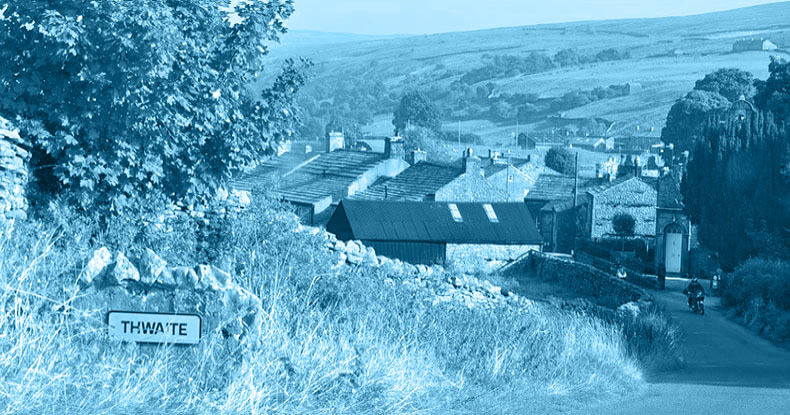 A lovely village in the beautiful area of Swaledale . A weird word ? Bar Thwart and Thwack I can’t think of any others which start thus . Thwaite derives from a Norse word and means essentially a cleared piece of forest. It’s quite common in place names in Cumbria, North Yorkshire and Northumberland, and also a Lancashire based brewery. I remember Thwaite’s as a fine quaffing pint. Pronounced “Twaites” by the locals. Thwaites sponsored the Blackpool balloon tram No. 716 for many years. It was by far the best all over advert tram Blackpool Transport ever used on the tramway. Thwaites Brewery HQ in Blackburn used to have a red neon sign that read THWAITES ALES and flashed certain letters off to appear as THWAITES AI ALES. After redundancies were announced some disgruntled employee reconfigured the sign to flash as THWAITES AI TWATS.